If you are a Texas parent looking for an excellent summer camp for your elementary-aged child, you are not alone. Finding a camp that is the right fit can be a challenge. Summers are meant for exploration and adventure, and iQurious Kids is excited to introduce you to a fantastic opportunity for both! Camp Invention is a program of the National Inventors Hall of Fame. A one-week STEM (science, technology, engineering, and math) camp, this program is designed for kids in kindergarten through sixth grade. Here’s a little more about the camp and why we think it’s worth your consideration. Local educators lead Camp Invention. The goal of the camp is to inspire campers for ongoing exploration and innovation. Campers are presented with challenges to solve encouraging creativity, problem-solving, and teamwork. Because of the collaboration the camp requires, the environment is high-energy and very active. Camp Invention prioritizes building campers’ confidence and encouraging their natural creative abilities. Many camp locations are available, so Texas kids across the state can take advantage of this amazing opportunity. With sessions throughout the summer, it is a top-notch way for kids to make memories this year. One of the things that makes Camp Invention unique is its curriculum. Every year, the camp introduces a new curriculum inspired by the inductees to the National Inventors Hall of Fame. This means that each summer, Camp Invention is “re-invented” with new challenges, emphases, and features. The 2018 curriculum is entitled “Fast Forward.” Campers will design a robot dog, work on a “smart” home, build a cake catapult, and more! Also, at the end of camp, each child will bring home two robots! Camp Invention is highly unique and exceptionally run. There isn’t another program like it in the United States. You children will be challenged, encouraged, and inspired. 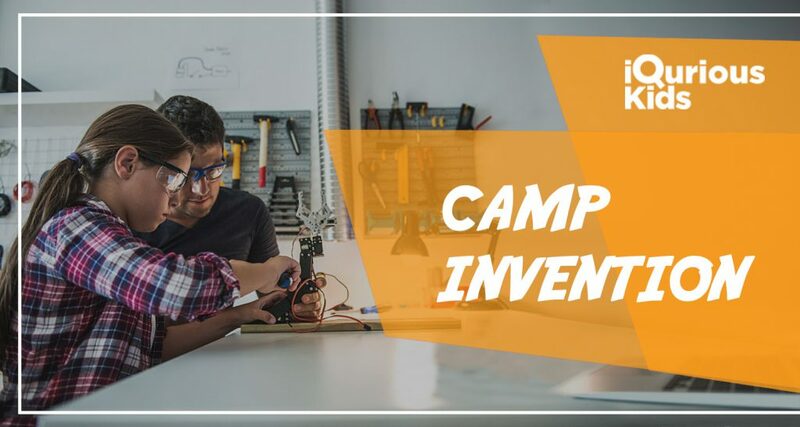 Using certified local instructors, Camp Invention allows your child to practice the skills that will help them succeed in today’s STEM-based world. This camp teaches skills like resiliency, entrepreneurship, teamwork, and out-of-the-box thinking. While your child is busy having fun, they will also be participating in hands-on activities that align with state and national education standards. Additionally, they will be inspired by the stories of real inventors, all while making new friends. Camp Invention is not just any science camp. With an emphasis on forward thinking and perseverance, the camp curriculum shows your child that with hard work and a great team, even the wildest things are possible. Camp Invention really is the whole package. To find a camp session near you, visit our website and search for your location! Previous article Summer Camps for Kids in Houston! !